An event long awaited by tile American sports car enthusiast arrived with the announcement by Kurtis-Kraft, the world's largest builder of race cars. of the new Kurtis Sports Car. Designed to suit tile tastes and conditions of this country, the new Kurtis presents an interesting combination of American styling and European design. 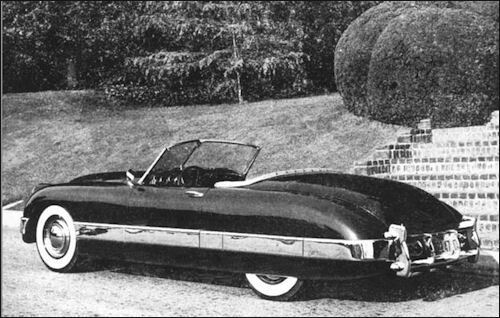 The lines of the new car closely resemble the Kurtis Custom Buick of 1948. No less than ingenious is the solution of the adequate bumper problem. Three horizontal bars are combined with the vertical override guards to form a grille unit. A similar unit protects the rear of the car and shelters the multiple tail and stop lights. Encircling the body and flowing into the bumpers is a wide chrome rub strip. At the cockpit. the hat-section box frame is full width and forms the bottom of the door sills. Standard width frame sections at front and rear are united to the center section. vertical truss construction giving required strength and floor panels furnishing rigidity. The firewall and cowl structure forms a box to stiffen the frame at that point. Like European sports cars, the driveshaft of the Kurtis runs over the frame, making possible a very low design. Individual leather upholstered seats, with three-way adjustment. are separated by the drive tunnel, lending an air of authenticity to the interior. Instruments are grouped in front of the driver and include tachometer, speedometer, oil and fuel pressure, manifold pressure. water temperature, fuel gauge. and ammeter. 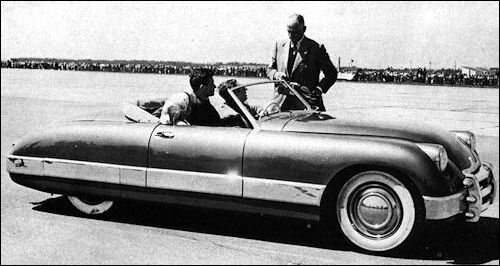 The influence of race-car design on the Kurtis Sports Car may be seen in the steering wheel. gear-shift lever, and other parts. Many standard American automotive components are used, assuring ease and economy in maintenance. Comforts expected of American cars, such as a complete ventilation system, are furnished. A wide choice of engines. ranging from 82 to 160 HP, will be offered. 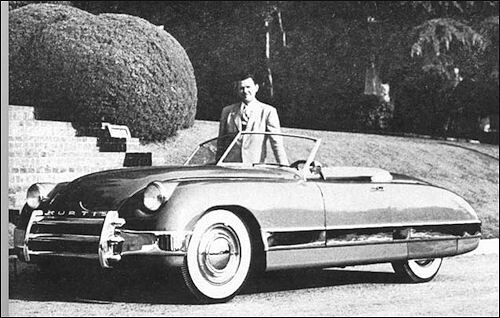 Names such as B.M.W., Lea-Francis, Offenhauser, and Ford have been mentioned. 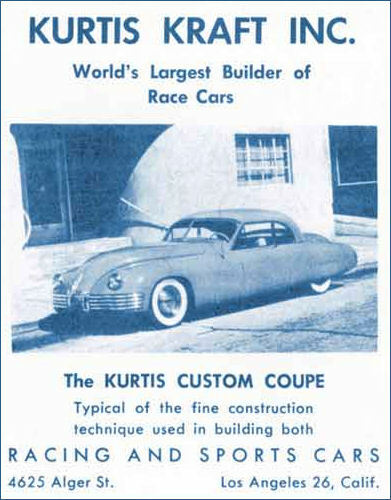 The Kurtis Sports Car is now in limited production and at a later date a "build-it-yourself" assembly kit will be available. During the recent SCTA Bonneville Speed Trials, a Kurt equipped with Edelbrook "full race" Ford V-8 engine, set an average speed on a two-way run over the measured mile 142.515 mph. Drugie miejsce (Parsons) w 500 mil Indianapolis (USA).